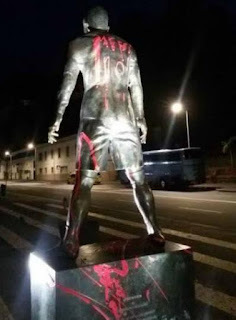 Cristiano Ronaldo's sister has blasted supposed fans of Lionel Messi who defaced the superstar's statue in his hometown, Madeiram after the 30year old lost to Lionel Messi in the Ballon d'or award showpiece on Monday. The statue was erected in Madeira's capital city, Funchal, in 2014 in honour of Ronaldo's achievements. 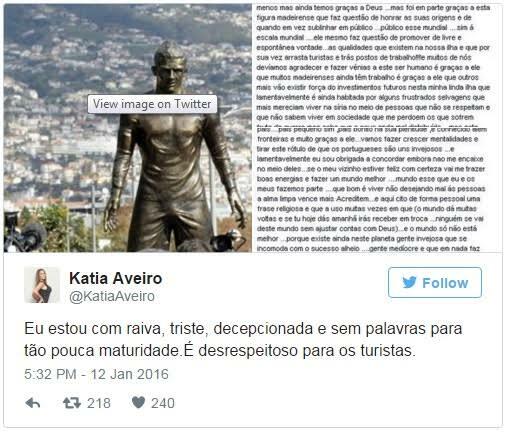 His sister, Katia Aveiro, expressed her anger after fans painted Messi's name and number on Ronaldo's statue. She felt they aren't grateful the player's success and fame has put the island on the world map even going a step too far by saying the fans deserve to live in ISIS war torn Syria.